In the early 1900s, Auburn Avenue became a magnet for emergent African American business, prompting John Wesley Dobbs to name it “Sweet Auburn.” Numerous churches, banks, restaurants, clubs and small stores flourished, serving the community while creating a strong urban environment. After decades of prosperity, however, the area fell into decline following World War II, and many of its buildings were either razed or became victims of neglect. 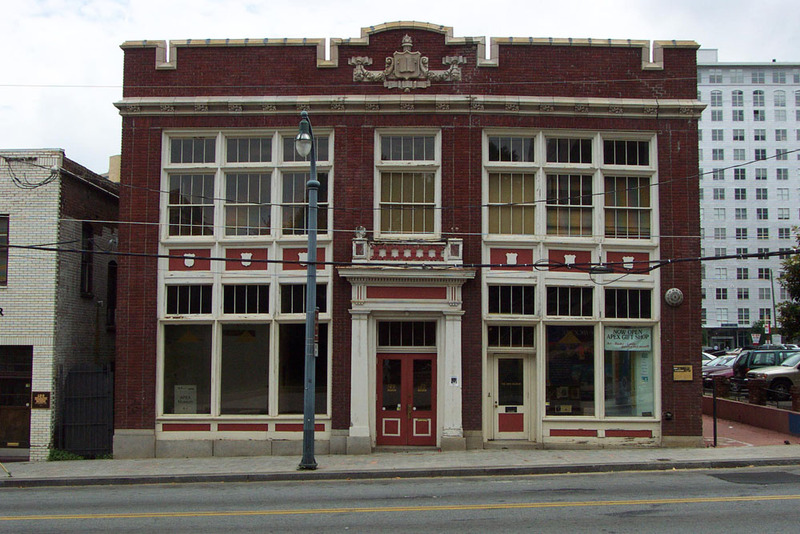 The building at 123 (now 135) Auburn Avenue is an architectural jewel that, although spared from destruction, lost much of its façade’s character as it progressed from its original capacity as a book depository, then a tire warehouse, and ultimately as the home for the Southern Education Foundation and the APEX museum. Designed by the firm of Hentz and Reid, 135 Auburn Avenue was built in 1910 as the Southern School Book Depository and was named after Dobbs in the 1930s. Neel Reid, who started practicing with partner Hal Hentz only one year earlier, labored with thoughtfulness on this project, depicting garland swags across the top, centered with the torch of knowledge and an open book. He also drew a handsome entrance, with wood pilasters supporting an ornate balustrade containing six scrolls flanked by two medallions, and two spheres balanced on the ends. By 2003 the front façade had lost its original door configurations, vital pieces of the balustrade (including the spheres), and contained rotted wood throughout. That year the building’s owners, the Southern Education Foundation, located funds to significantly restore it. They chose Tony Menefee, well-known for sensitive contextual renovations and restorations, to bring the jewel back to its original sparkle. He detailed the most faithful façade restoration possible based on the available information, recovering original drawings from Hentz and Reid at the Atlanta History Center. The firm restored the balustrade, replaced wood trim, painted and cleaned the front façade, stabilized and sealed the terra cotta cornice, and replaced eight single-pane windows on the second floor of the east façade to match original double-hung configuration, and had new mahogany entrance doors fabricated in strict compliance with original drawings. 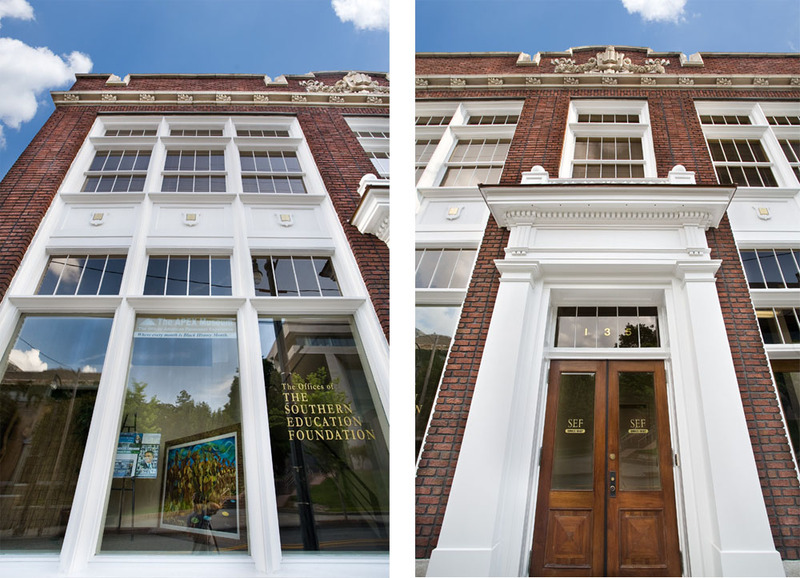 Now visitors to the Southern Education Foundation’s offices, the APEX museum, and Sweet Auburn are greeted with a fresh façade that will carry its proud heritage well into the future. 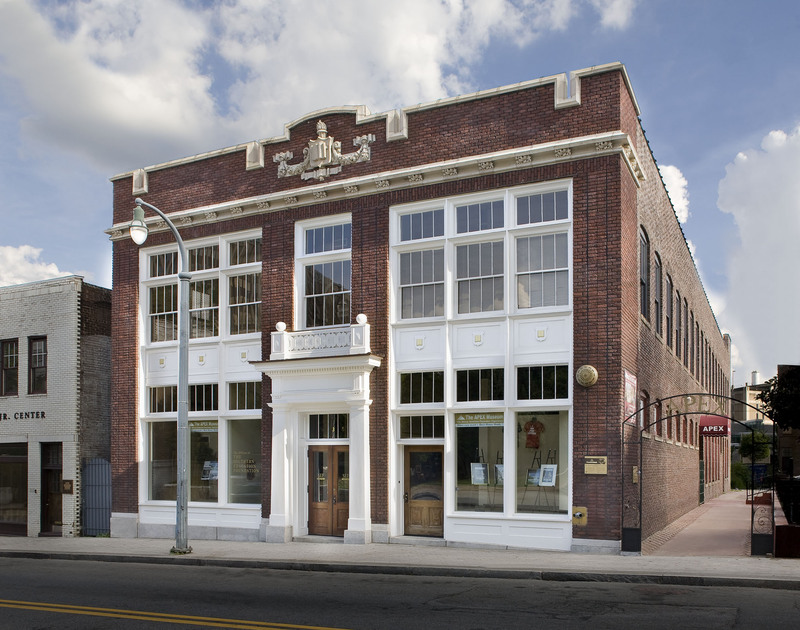 The first restoration, completed in November 2004, extended the life of an important work of architecture by a renowned architect in a historic location and earned an Atlanta Urban Design Award for Historic Preservation. 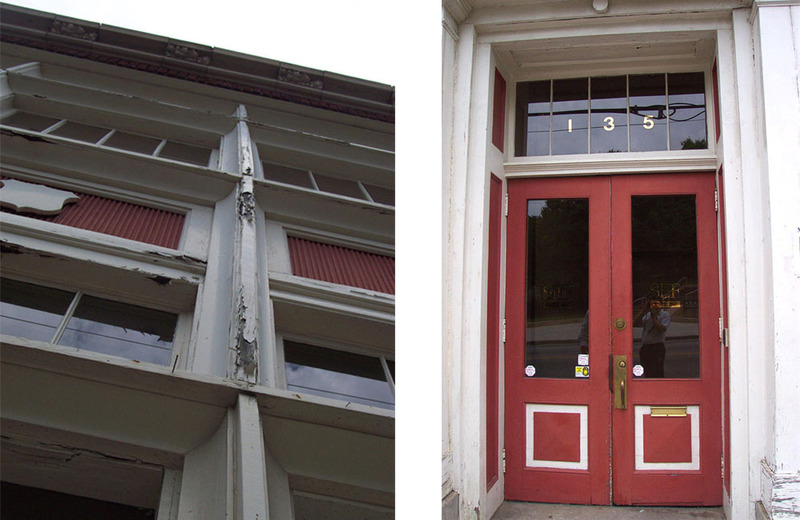 A second restoration to the façade ensued after Atlanta’s 2008 tornado severely damaged the brick façade, roof, parapet, and storefront. The sagging façade that remained from the 2004 restoration was meticulously reconstructed from detailed drawings, rigorously locating each brick for rebuilding. The second restoration won another Atlanta Urban Design Award in 2009.